Oh well, I should just be happy it held off this late into the season. If I'm lucky this will be all we get and spring will be right around the corner... it is the last day of January after all. TGIF and have a great weekend my friends! Well, it looks like I'm going from one extreme to the other. Seeing as how my last card used a stamp that I've been holding on to for years while today's card features a stamp that I just got in the mail. Yep, this Skyward Anya showed up in my mailbox yesterday and as soon as I took her out of her packaging I ended up getting her onto a card. I confess that while I think Skyward is a cutie, I didn't know if I would use her much... I mostly got her for her body since with a head swap I think she'll make for a pretty winter attired Anya. So I surprised myself by actually using her as is this first time out. 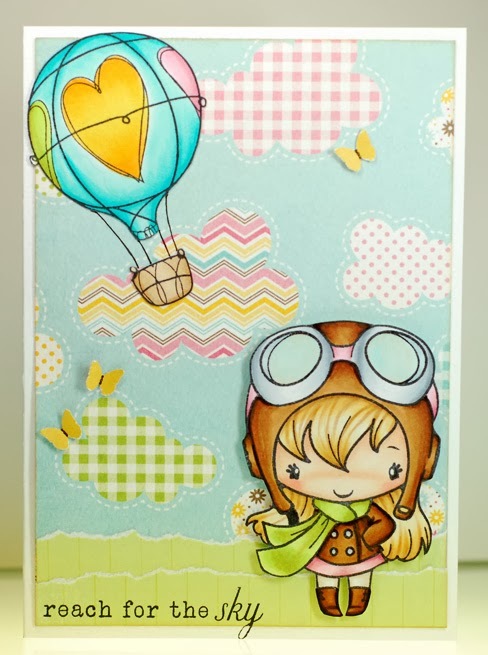 I even paired her up with the hot air balloon from the retired Fly Away TGF set, talk about a match made in stamping heaven, LOL! Alrighty, time to see kind of trouble I can get myself into today. Well, I've got a couple days off now and there are a few stamps that I've been itchin' to color up so I'm sure I'll see ya again manana! The paper is old KI Memories and once I had it glued down there was something about it that made me want to add the black strip and have this card look kinda like a school notebook. Must be the doodle look to the print, I know I spent many a class doodling away on my notebooks during my school years. Anywho... a few little embellies and this card was done. Well, I should get this day started. Thanks for stopping by! 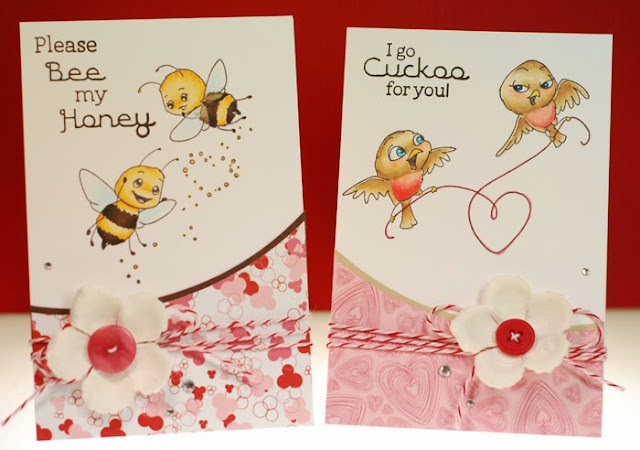 It's review preview day over on the CCD blog and we are shining the spotlight on the new Valentine Birds and Bees stamps from Sweet November. For my card I used The Birds once again and this time around colored them up to look like a couple of Goldfinches. Love is definitely in the air with these two as they go about their aerial courtship. 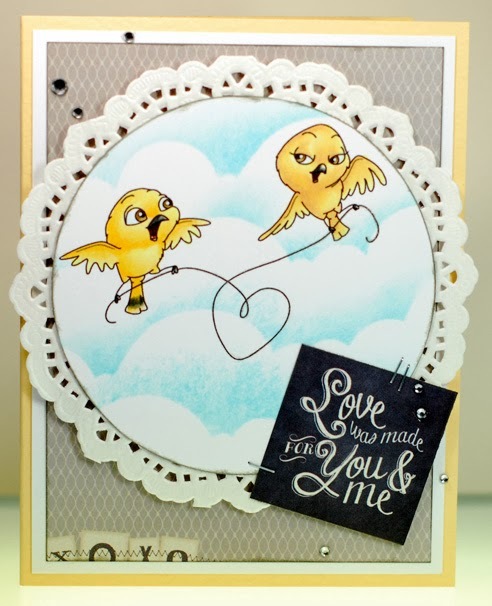 I'm still a fan of pairing yellow and grey together so I grabbed this great print from the Crate Love Notes paper pad. I think it makes for a lovely alternative to the traditional reds and pinks of most Valentine cards. Well, I've got another long day ahead of me. 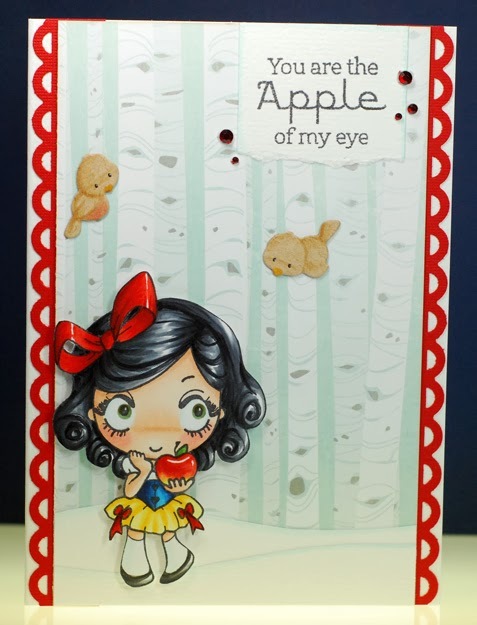 I got my hands on a new-ish Pee Wee Designs digi stamp called Sweet Cupcake and thought she had a great winter time look. Sure she's all bundled up but with that thick hair of hers I'm not sure she even needs the beanie to keep warm. 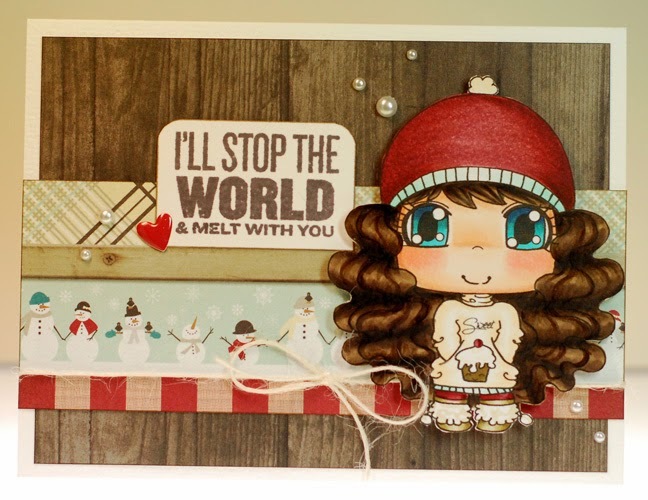 I paired her up with a new Timber Grove paper pad that I wanted to use before the cold season was completely over... those little snowmen were just too cute not to get on a card with her. Ok, I should get a move on. Ok, I've really got to run now... thanks for stopping by! I usually try to mix up the stamps I use on here from day to day but when I sat down to create yesterday, I couldn't resist playing with another one of the new TGF stamps I got this past weekend. This sweet little lady is part of the Miss Anya Night Out set and I had a hard time choosing which of the three to ink up first. I ended up going with the most casual looking one of the bunch because I thought she would pair nicely with this floral paper from Pebbles. Okey dokey... take it easy! Ok, time for me to scoot my boot... TTFN! LOL, seems I spoke too soon about having some snow for Winter Fest... the sun came out yesterday and once again the ground is bare. What a weird winter this continues to be. Next weekend is when they usually have ice sculptures carved and displayed in the park but if this keeps up they will melt as fast as they are being carved. Ok, it's off to work I go yet again. 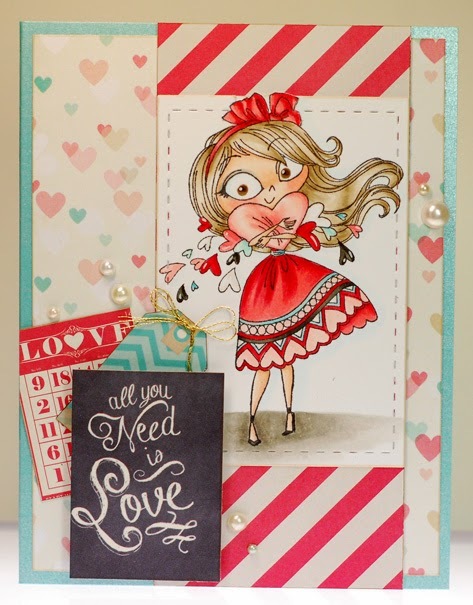 This little girlie was made for Valentine's day cards so I paired her up with some papers from the Crate Love Notes 6x6 pad. 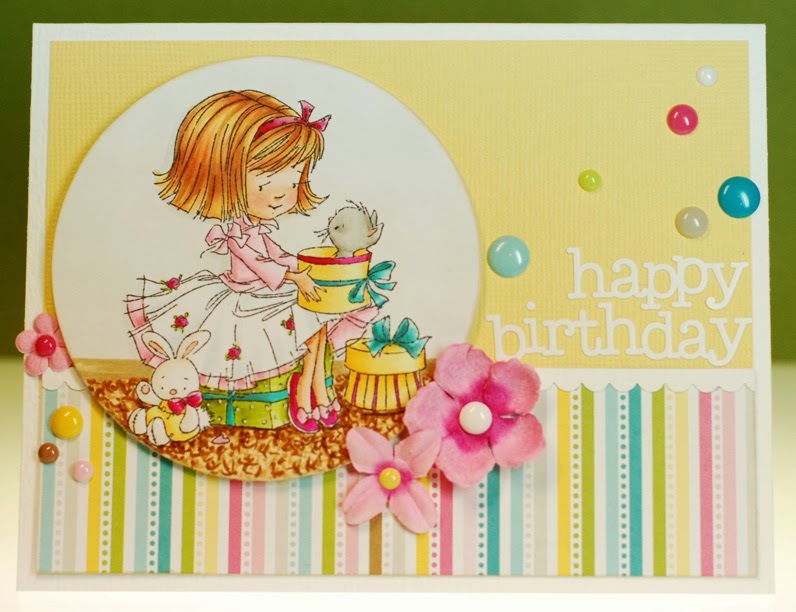 As always, I love the little cut-a-part papers that make for quick and easy sentiments and put them to good use on this card. Well, it's the first weekend of our annual Winter Fest in town so I should get a move on. I guess having a bit of snow for the festivities is a pretty good thing. My card making however is still leaning towards a decidedly spring time bent. 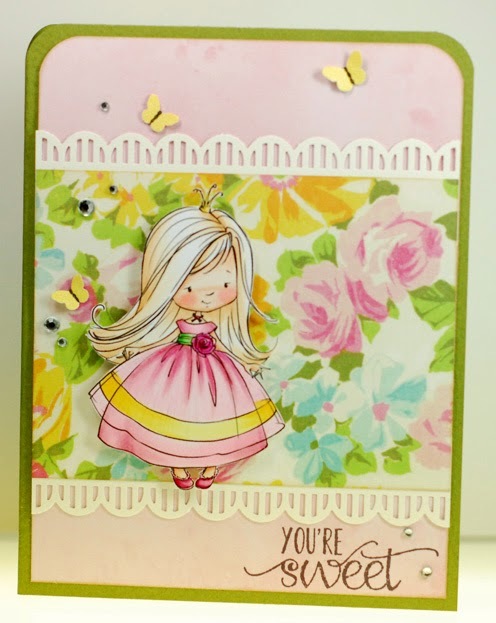 I used the Princess digital stamp from Sugar Nellie on this one and found this lovely floral print when I was digging around my paper scraps. She's such a pretty little gal and now this princess looks like she is enjoying a stroll through the royal gardens... I can almost feel the sun shining. Ok then, time for me to get ready for the day. I've got a couple days off ahead of me and I really need to do a major clean up in my crafty room. All of the Christmas papers and supplies need to get off my table and be put away until it is time for holiday cards again. As it is now, I've only got like a 6x6 space clear enough to create on and that is just now conducive to me getting much done at the moment. I actually made this card because I didn't want to try digging anything out from the clutter. 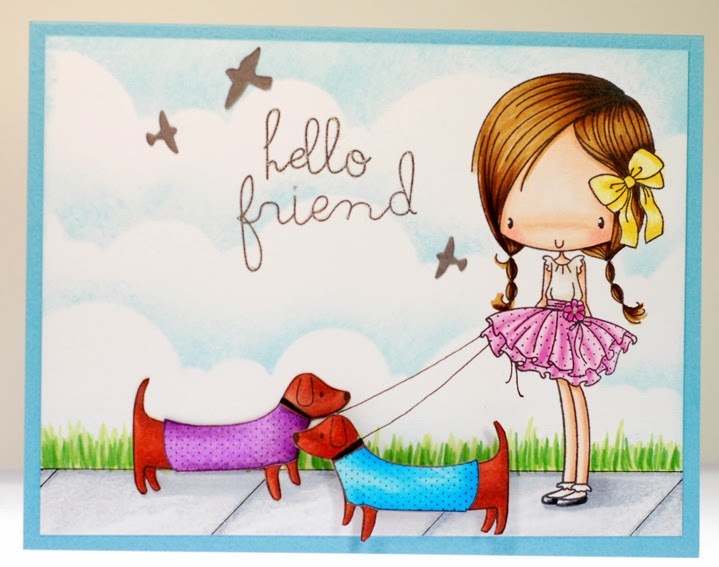 This new Best Friends stamp set from MFT was right at hand so I decided to not fool around with any papers or anything, simply stamp a whole scene and go. No matching Copic colors to papers, I just did whatever I wanted to and the result is a very spring time looking card. I gotta say, the spring dreaming doesn't seem so far off here... we still haven't gotten any snow this year which is quite unusual. If it wasn't for the below freezing temps a person could think that we were closer to tulips and other green growing things than we really are. Well, thanks for stopping by and I hope your week is off to a great start. 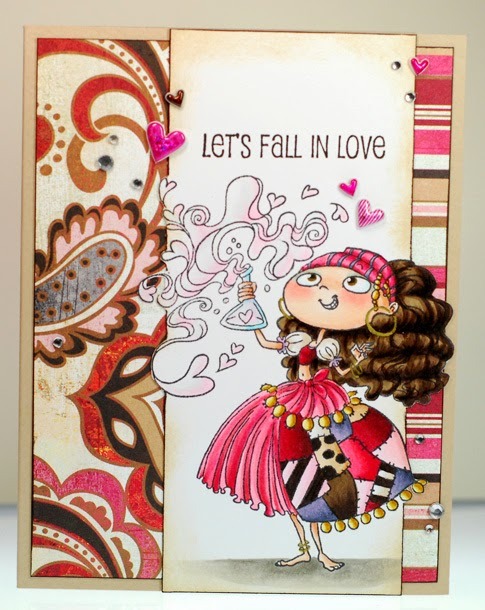 It's time to announce the winner of the Sweet November January release! Congratulations Lindsay! Please email me at: pete_danger @ hotmail.com with your mailing info and I will get your prize sent out as soon as possible. Big thanks again to everyone who came out for the January previews. 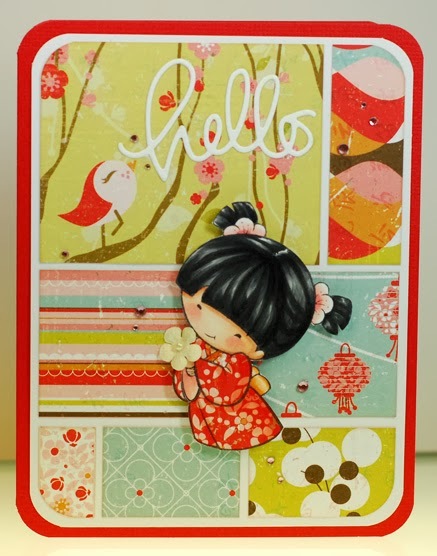 Don't forget that all of the new stamps and die cutters are now available in the CCD store. The birds and the bees... and the candy! 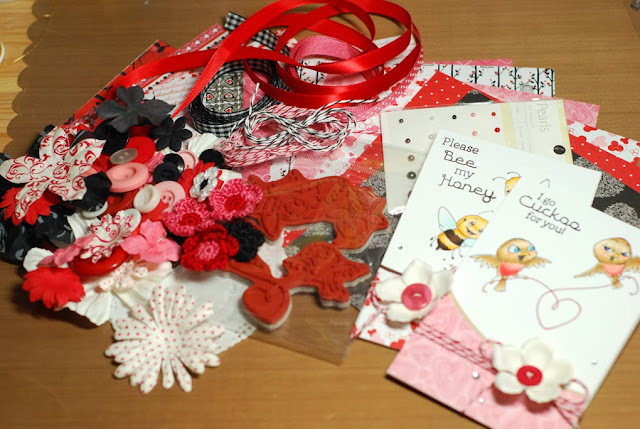 The Birds and the Bees candy kit includes; two Sweet November rubber stamps, twelve 6x6 sheets of BoBunny Crush paper, Prima flowers, Kaiser Craft pearls, ribbon, twine, buttons, doilies, crochet flowers, four envelopes, four card blanks and my card. All you have to do for a chance to win the candy is leave a comment on this post. If you link to the candy on your own blog that is great and much appreciated but not a requirement... I want everyone to be able to play along. And when I say everyone, I mean everyone. I will ship the candy anywhere in the world so everyone is encouraged to play! :) The candy will stay open through Friday, January 3rd and I will announce the winner on Saturday, January 4th. Instead of using random generator I will be printing out names and tossing them in a hat SO if you leave a comment for the SN gal's blog, you will get an extra name in the hat... this will up your chances of winning the candy. Fun, fun, fun! That's a wrap on the CC Designs January sneak peeks. There are even more Birds and the Bees previews over on the CCD blog today with another chance to comment and win so don't miss that as well! And all of the new January stamps will be available in the CCD store tomorrow morning, January 2nd, at 9am est!